This site is named for William T. Gunn, Jr. (1961-1992), a New York Police Detective who was shot in the line of duty and died as a result. Raised in Bellerose, William Gunn joined the New York Police Department in 1982. He received nine commendations during his seven years of service, including an award for meritorious police duty. Gunn worked most of his time on the force in Queens, but in 1988, he was assigned to Brooklyn’s 67th Precinct detective squad. On January 20, 1989, Gunn was shot by a fugitive while trying to give assistance to fellow officer. Injured, Gunn fell into a coma and passed away on November 27, 1992. Part of a huge Jamaica land grant from the Director General of New Netherland, Peter Stuyvesant (1610-1672), Bellerose was first settled by English colonists in 1656. Following the British defeat of the Dutch, the area became a British colony, joining Queens County in 1683. Until the early 20th century Bellerose was largely farmland known as “the little plains.” The name Bellerose comes from the achievements of Helen Marsh, an entrepreneur from Massachusetts who built a model community and a railroad station in western Nassau, calling it Bellerose. The neighborhood adopted the same name as it expanded during the building boom of the 1920s, aided by Marsh’s construction of a railway station here on the Long Island Rail Road line in 1911. 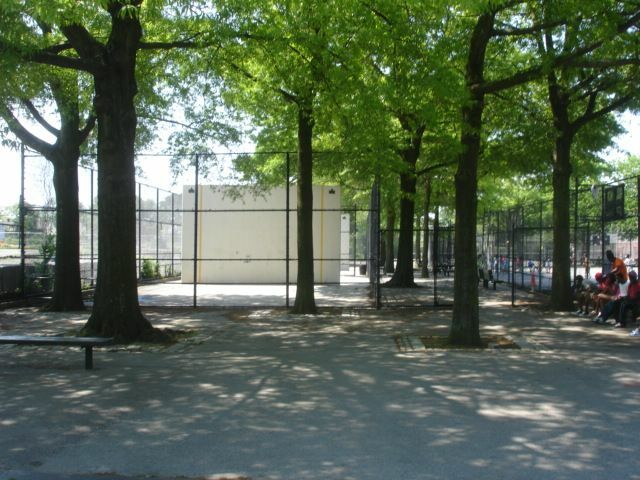 Located between Hillside Avenue and 235th Court, this playground is jointly operated by Parks and the Board of Education, which operates the adjoining P.S. 18. The City of New York acquired this land in 1953, and jurisdiction was transferred to Parks later in the year, and to the Board of Education in 1964. Originally named P.S. 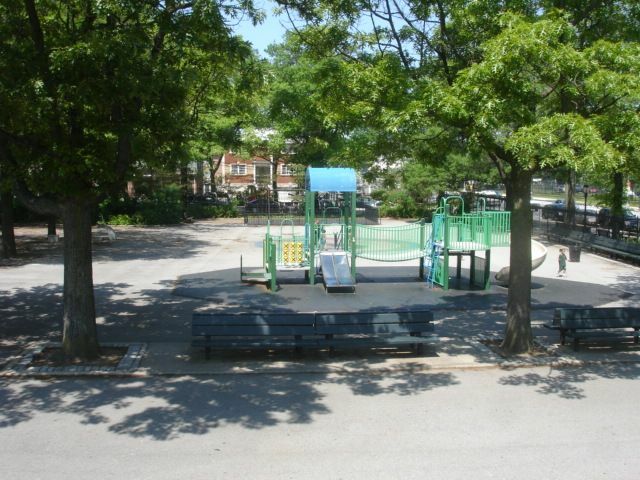 18 playground, the playground was renamed by a local law in 1991. P.O. William T. Gunn, Jr. Park. It is presently undergoing a two-stage renovation. 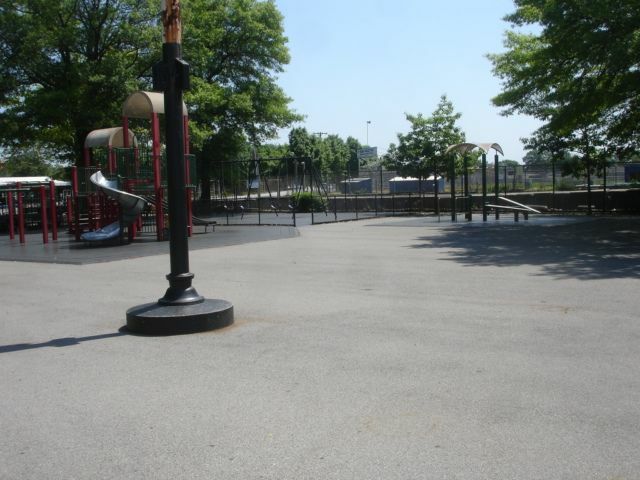 The first stage, to be completed by early 2002, is funded by $321,969 from Mayor Giuliani, and will create a new play area featuring two new sets of steel play equipment, safety surfacing, swings, a drinking fountain, a large asphalt area and a flagpole with a yardarm. The second stage of the renovation, scheduled for completion in 2003, will be funded with $400,000 that was allocated by Council Member Sheldon S. Leffler, and will see the creation of handball and basketball courts as well as a seating area with benches.